For Natural Family Planning purposes, the first day of the menstruation (period) is counted as the first day of a new cycle. The period (which lasts between 4-6 days usually) is simply the unused lining of the previous cycle being washed away amid blood loss so that a new cycle can start. It must be pointed out that not all “bleedings” are menstruations. For example, in the teenage years, or the pre-menopause years, or in stress situations, women can bleed erratically and mistakenly count some of these bleeds as their usual menstruation. 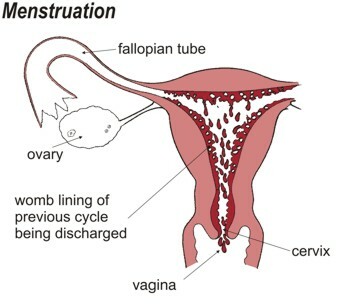 A true period is a bleeding which follows about 10-16 days after an ovulation. 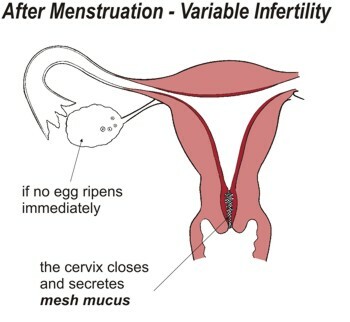 As the period draws to an end, if the egg for that cycle has not yet been chosen, the cervix is pinched shut and the thick sticky “mesh” mucus fills the cervix. The woman is then in an infertile phase of her cycle. How long does this phase last? It varies from woman to woman, and even for the same woman at different stages in her life. Women whose cycles are very regular, may find they have the same number of infertile days month after month, but other women will find variations. Some cycles will have fewer days, others more days. Some women with very short cycles may have none at all, but may go straight into the fertile phase. Careful observation and instruction is needed in this phase of the cycle to accurately identify the genuinely infertile days at the start of a cycle.